The Rumble Roller provides cutting edge trigger point massage. Foam roller massage for beach running. Reduce pain, prevent injury, and enhance self myofascial release (SMR) with foam roller massage. This is the newest injury intervention for beach running and CrossFit athletes. Staying in shape requires more than just a commitment to consistent workouts. You must, also, be continually monitoring your body for strains, pulls, and spasms that can lead to lingering injuries...and downtime. SMR is a proven method to reduce tightness, inflammation, and boost an increase in flexibility. Using a foam roller to enhance self myofascial release is a staple of the people I run with here on the Florida Gulf Coast beaches. I love running on the beaches here in Paradise (Treasure Island FL), but it is not all romantic. There are still realities to account for...and they put stress on body parts that can create "overuse" injuries. 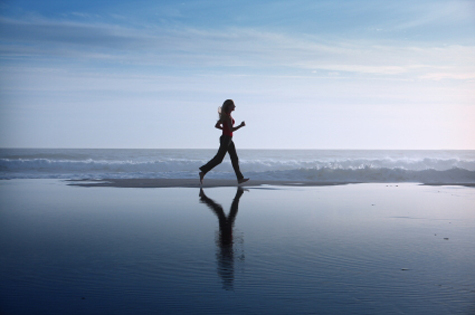 First, you are running on uneven surfaces about 99% of the time, especially at high tide, when you cannot run on the more-compacted shoreline sand. Secondly, you are usually running on a slight incline with the leg farthest from the surf. Third, you will usually be required to dodge, or jump over a few things on any run. It can be a rouge wave hitting the shoreline, a dead fish washed up in your path...or my favorite...long deep trenches dug by 7-year old visitors with toy beach shovels. All of these situations produce strains on muscles, and connective tissue, that can easily accelerate injuries. For this reason, foam roller massage for beach running is critical. Foam roller massage is a must for CrossFit athletes who workout at the beach, or guys (and gals) who mix strength training and interval running. 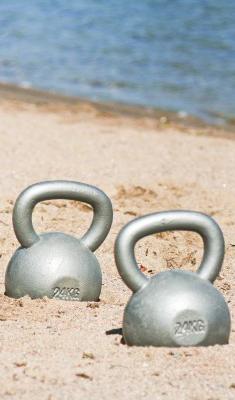 Push-ups, pull-ups, kettlebell swings, burpees, and handstands in the sand all contribute to upper-body soreness and inflammation. By performing SMR with a foam roller, beach runners and CrossFit athletes are able to breakdown scar tissue adhesions that amplify inflammation, reduce trigger point trauma, and decrease the tension of dysfunctional fascia that surround bones and muscle. The result is a vast reduction in pain, healing is accelerated, joint mobility increases, and nagging injuries are thwarted. 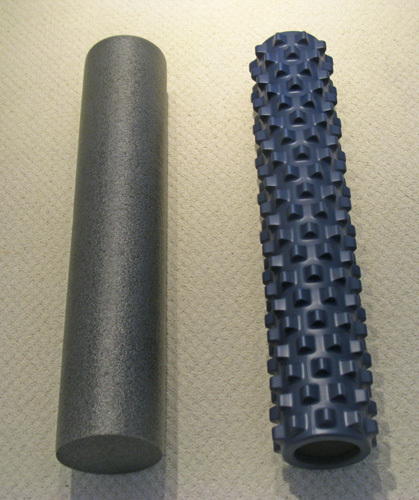 There are two kinds of foam rollers that we use at home. One is the traditional, smooth kind...and the other is the state-of-the-art Rumble Roller. As you can see, there is quite a bit of difference. And...all of us use both. I like to use the smooth one immediately when I get out of bed, to workout the knots and kinks that mysteriously happen while I'm sleeping. It makes a nice transition to the Rumble Roller, which provides a much more intense, and deeper massage. The benefits of the Rumble Roller are extraordinary, but it does take about a week or so to get used to the feel. Below is a video by Dr Charles Staley that will elaborate on these benefits. Self myofascial release is most easily done with a foam roller. It only takes about 10-15 minutes when you focus on a specific trigger point that feels like it is about to spasm. For most of us, we start with an easy full-body pass for a few minutes, and finish with one. * Relieve joint stress and muscle soreness. * Relieve tight and knotted muscle tissue. * Increase extensibility of tendon tissue. * Correct tight muscle imbalances. * Decrease the incidence of spasms. * Enhance rehabilitative recovery from injury. If you are a runner, or a CrossFit athlete (like most of us) I support you in checking out the benefits of SMR. I hope this short post has helped you learn a little about why we see foam roller massage for beach running as an important issue. CLICK HERE to learn more about the Rumble Roller. Your Daughter Can Have A Beach Wedding For $2000!